Time to celebrate the New Year, on New Years Day, January 27th! Well, if you’re like me and you live by the Madagascar Calendar, then you know what I’m talking about. 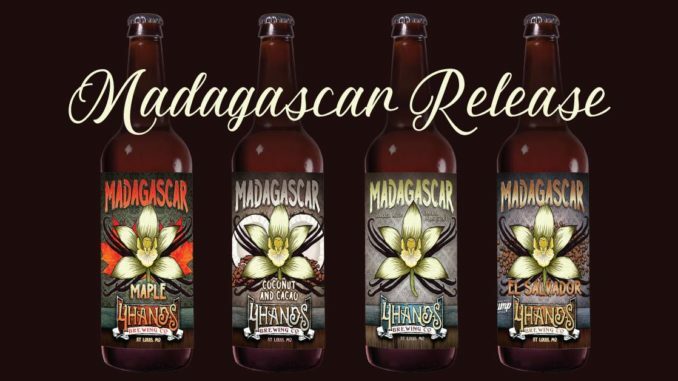 We plan our entire year around the release of one of our favorite beers, 4 Hands Brewing Company’s epic Madagascar. The big day will be January 27th, complete with new variants and a new single-barrel project this year! On this day you can look forward to an opportunity to try on draft and purchase bottles of Madagascar, Madagascar Coconut & Cacao, Madagascar El Salvador, and Madagascar Maple. There will also be special Single Barrel Gift sets available hand selected by 4 Hands along with a bottle of Madagascar that was aged in the same barrels. This is not a ticketed event. Sales begin when they open at noon and go until they sell out. As the day goes on, based on turnout, the number of each beer you’ll be allowed to purchase may taper back. So to ensure you get what you want, remember to get there early! Madagascar Coconut & Cacao is a brand new addition to the Madagascar lineup. 4 Hands aged their Madagascar Imperial Milk Stout in Bourbon barrels with toasted coconut and cacao nibs. The result is a rich, multi-layered mixture of coconut, chocolate, vanilla, and Bourbon. Sump Coffee was able to provide 4 Hands with a unique micro lot of natural process coffee to add to the Madagascar Imperial Milk Stout. Grown at the Finca Calera farm in the Alotepec Metapan region of El Salvador, this coffee has a bright, raspberry fruitiness. Madagascar El Salvador has layers of Vanilla and Bourbon that blend perfectly with complex flavors of this small batch coffee. Madagascar Maple is a new take on Madagascar Imperial Milk Stout. This batch was rested in ex-Bourbon barrels that were used to age maple syrup. Strong maple notes dominate the aroma, backed up with a complex blend of vanilla, oak, and chocolate. This gift set includes a bottle of Single Barrel whiskey from a batch hand selected by the brewers at 4 Hands along with a bottle of Madagascar that was aged in that same whiskey barrel. Madagascar Single Barrel is the second installment in our Single Barrel series. Brewers hand-selected 2 barrels of 10-year-old Rye Whiskey. After bottling the Rye, they used the barrels to age Madagascar Imperial Milk Stout with whole vanilla beans. This project provided 4 Hands with an incredible opportunity to showcase the unique characteristics of these hand-selected barrels.